Magnesium (Mg) is the third most abundant metal in the earth’s crust. It exists in the form of hexagonal closed packed (HCP) crystal structure. Magnesium is the fourth most abundant mineral in the human body, which are responsible for various metabolic reactions and biological mechanisms. A normal human body contains about 22-26 grams of magnesium, in which 60% is present in skeleton, 39% in intracellular medium, and 1% in extracellular compartment. Furthermore, the main source of energy for living cells i.e. adenosine triphosphate (ATP) must require magnesium ions for their biological activity . In addition, magnesium is essential for plants in chlorophyll synthesis and photosynthesis . Although the magnesium is found in many food ingredients, but it is usually present in very low levels . Thus, deficiency of magnesium is likely common among geriatric , obese, diabetics, and alcoholic people . Deficiency of the magnesium in human body, known as hypomagnesaemia that causes many diseases such as osteoporosis, diabetes, and heart disease [6,7]. Currently, magnesium deficiency can be overcome by increase of magnesium concentration in diet or through oral supplements. Nevertheless, in oral supplement of magnesium, the dissolution, absorption, bioavailability, and permeability plays a major role. It was reported that dissolution and bioavailability of minerals are closely related to its crystal structure, crystallite size, and physical properties such as particle size and surface area . Recently, dissolution, absorption and bioavailability of magnesium is improved by using various kind of magnesium-salts such as magnesium oxide, magnesium chloride, magnesium sulphate, and magnesium citrate [9,10]. Besides this, magnesium is also utilized in synthesis of Grignard reagent, which is primarily responsible for the formation of carbon-carbon bonds, carbon-silicon bonds, carbon-boron bonds, carbon-phosphorus bonds in synthesis of various pharmaceutical products . After considering the vast importance of magnesium in life of living organisms, authors wish to investigate an economically safe approach that could be beneficial to modify the atomic and physical properties of magnesium powder. In physics, the energy is considered as the ability to do work; which fundamentally interrelates with matter as E=mc2 (Einstein’s famous equation). However the energy can be considered as a field of force which effectively interacts with any matter at a distance and cause action. Researchers have confirmed that bio magnetic fields are present around human body, which have been evidenced by electromyography (EMG), electrocardiography (ECG) and electroencephalogram (EEG) . Scientists have postulated that it is due to the flow of bioelectricity (generated from heart, brain functions or due to the motion of charged particles such as protons, electrons, and ions) in the human body. As per the basic fundamental law in physics, when an electrical signal passes through any material, a magnetic field is generated in the surrounding space . Hence, a magnetic field is created along with the bioelectricity in human body, known as bio magnetic field. Due to this, a human has ability to harness the energy from environment/universe and can transmit into any object (living or non-living) around the Globe. The object(s) always receive the energy and responded into useful way that is called biofield energy. This process is termed as biofield treatment. Mr. Trivedi’s biofield treatment is known as Trivedi Effect®. Mr. Trivedi’s biofield treatment is known to alter the physical, structural and atomic level in various metals [14-16] and ceramics [17,18] in material science. Additionally, biofield treatment has significantly studied in the field of microbiology [19-21], biotechnology [22,23], and agriculture [24-26]. Recently, it was reported that biofield treatment had increased the particle size by six fold and enhanced the crystallite size by two fold in zinc powder . 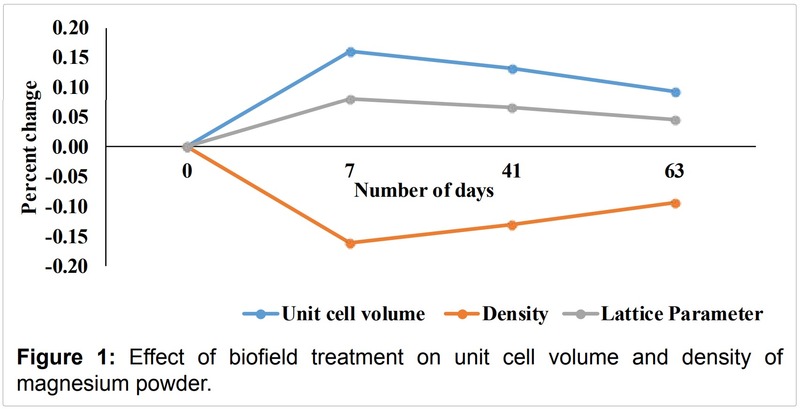 In another report, biofield treatment has shown the significant effect in carbon allotropes, where the unit cell volume was decrease by 1% and crystallite size was increased by 100% . Based on the outstanding result achieved by biofield treatment on metals and ceramics, an attempt was made to evaluate the effect of biofield treatment on atomic and physical properties of magnesium powder. The magnesium powder was purchased from MEPCO, India. The sample was equally divided into two parts, considered as control and treated. Treated group was in sealed pack and handed over to Mr. Trivedi for biofield treatment under laboratory condition. Mr. Trivedi provided the biofield treatment through his energy transmission process to the treated group without touching the sample. The control and treated samples were characterized using X-ray diffraction (XRD), surface area analyzer, and particle size analyzer at different time periods. XRD analysis of control and treated magnesium powder was carried out on Phillips, Holland PW 1710 X-ray diffractometer system, which had a copper anode with nickel filter. The radiation of wavelength used by the XRD system was 1.54056Å. The data obtained from this XRD were in the form of a chart of 2θ vs. intensity and a detailed table containing peak intensity counts, d value (Å), peak width (θ°), relative intensity (%) etc. Additionally, PowderX software was used to calculate lattice parameter and unit cell volume of magnesium powder samples. Where AControl and ATreated are the lattice parameter of treated and control samples respectively. Similarly, the percent change in all other parameters such as unit cell volume, density, atomic weight, nuclear charge per unit volume and crystallite size were calculated. Where, S Control and S Treated are the surface area of control and treated samples respectively. Where, (d10) Control and (d10) Treated are the particle size, d10 of control and treated samples respectively. Similarly, the percent change in particle size d50 and d99 were calculated. Table 1: X-ray diffraction analysis of magnesium powder. nuclear charge per unit volume in iron, zinc and copper [27,28]. The change in atomic weight and nuclear charge per unit volume indicates that number of protons and neutron probably altered after biofield treatment. It could be possible if a weak reversible nuclear level reaction occurred in treated magnesium after biofield treatment. Thus, it is assumed that biofield treatment probably transferred the energy to magnesium atoms and that might cause these alteration at nuclear level . Besides this, the crystallite sizes of control and treated magnesium powder were computed using Scherrer formula and presented in Table 1. Data showed that the crystallite size was decreased from 87.16 (control) to 72.60, 72.60, and 62.23 nm in treated magnesium sample on day 7, 41, and 63, respectively. 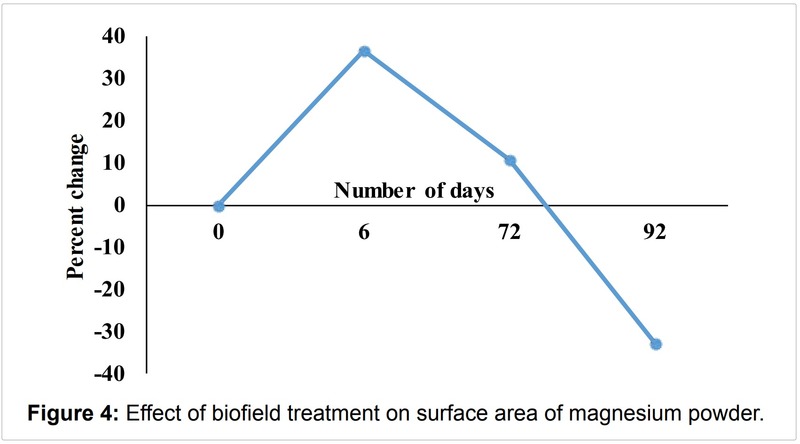 It suggests that crystallite size of treated magnesium powder was significantly reduced by 16.70, 16.70, and 28.60% on day 7, 41, and 63, respectively as compared to control (Figure 3). It was previously reported that biofield treatment has reduced the crystallite size in cobalt (Co), manganese (Mn), and titanium (Ti) . Moreover, the existence of severe lattice strains in treated magnesium are evidenced by the change in unit cell volume (Figure 1). Thus, it is assumed that presence of these internal strains may lead to fracture the grains into sub grains and decrease the crystallite size. Furthermore, it is demonstrated that the rate of dissolution may also be altered by choosing a suitable polymorph of a compound, which has low crystallinity or high amorphous phase and hence exhibits higher solubility . Torrado et al. reported that solids with small crystallite size exhibits faster dissolution rate as compared to solids with higher crystallite size . Thus, it is hypothesized that biofield treated magnesium powder may exhibit the higher dissolution rate as compared to control. Where, D is diffusion constant, Cs and C are the concentration in the bulk dissolution medium and diffusion layer surrounding the solid, respectively, L is diffusion layer thickness. Thus, Noyes-Whitney equation, inferred that the rate of dissolution may be modified primarily by altering the surface area of the solid. Hence, it is assumed that biofield treated magnesium powder, having higher surface area may exhibit higher rate of dissolution as compared to control. This higher dissolution of a mineral in the human gastric fluid, make it easily available for absorption in the body, which may results into higher bioavailability as compared to control. Table 2: Surface area analysis of magnesium powder. Table 3: Particle size analysis of magnesium powder. to control on day 75. It is possible that fresh surface generated through fracturing, possibly welded with each other and increased particle size . Furthermore, d10 was reduced by 6.75 and 14.44% on day 80 and 98 respectively as compared to control. 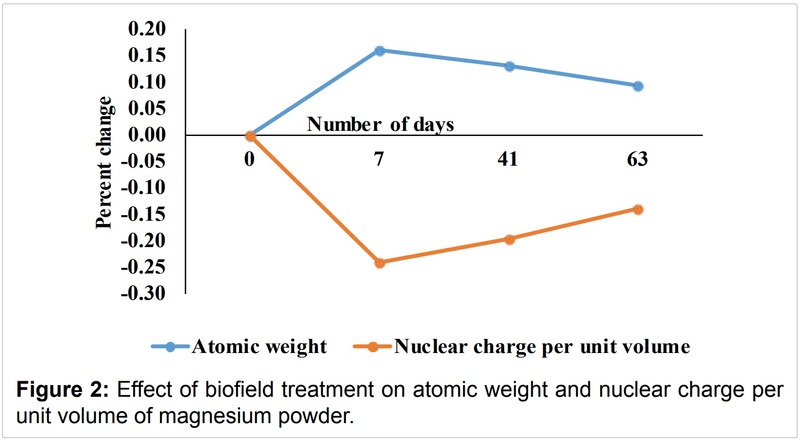 In addition, average particle size, d50 was changed from 256.7 μm (control) to 260.7, 290.5, 261.5, and 252.6 μm in treated magnesium powder on day 10, 75, 80, and 98, respectively. It suggests that d50 was increased by 0.16, 13.17, and 1.87% powder on day 10, 75, and 80 respectively, whereas it was slightly decreased by 1.59% as compared to control on day 98 (Figure 5). In addition, larger particle size d99 was reduced from 501.5 μm (control) to 502.3, 500.1, 498.4, and 498.9 μm in treated magnesium powder on day 10, 75, 80, and 98, respectively (Table 3). It suggests that d99 was not significantly changed after biofield treatment. 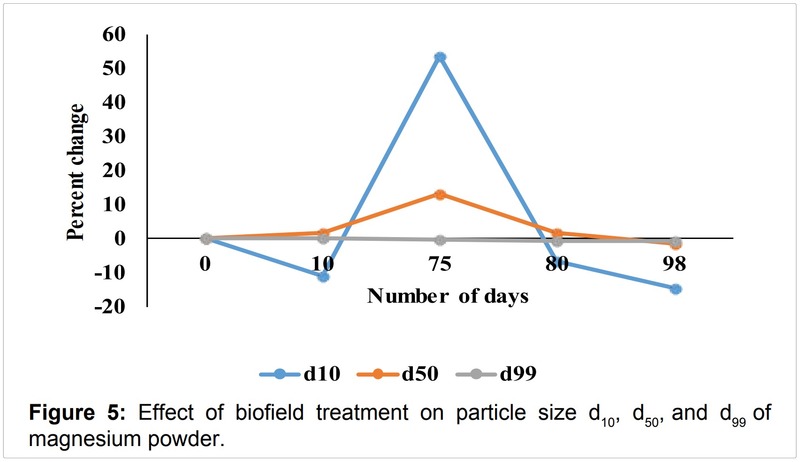 Thus, the particle size data suggest that medium (d50) and smaller (d10) size particles were more affected through biofield treatment as compared to large (d99) particles. It was previously reported that biofield treatment has significantly altered the particle size in aluminium  and zinc powder . Moreover, it is well established fact that particle size and surface area are having inverse relationship i.e. smaller the particle size, the larger the surface area. The increase in surface area on day 6 (Figure 4) can be correlated to reduction in particle size of smaller particles (d10) on day 10 (Figure 5). Further, data showed that on day 72 surface area reduces up to 0.33 m2/g as compared to 0.41 m2/g i.e. found on day 6, which may be due to increase in particle size d10 and d50. Furthermore, the reduction in particle size (after day 75) and surface area (after day 72) is contrary. It is possible that the fresh surfaces of the particles obtained after fracture got oxidized and which probably results into low surface area as compared to control . Therefore, particle size and surface area result suggest that biofield treatment has altered the physical properties of magnesium powder. In summary, the biofield treatment has significantly altered the atomic and physical properties of magnesium powder. XRD data revealed that biofield treatment has increased the unit cell volume and atomic weight up to 0.16% and reduced the nuclear charge per unit volume up to 0.24%, as compared to control. The crystallite size of treated magnesium was significantly reduced up to 28.59% as compared to control. It is assumed that the internal strain induced by biofield treatment may fracture the crystallite and reduced crystallite size. Besides, the surface area of treated magnesium was increased up to 36.5% as compared to control. 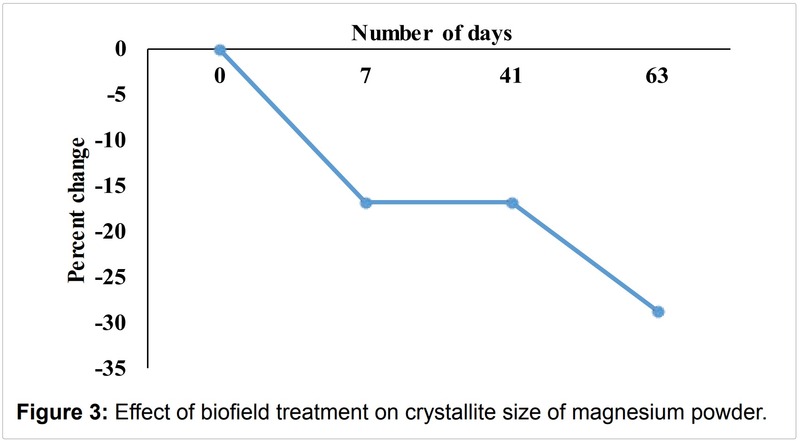 It is assumed that higher surface area and lower crystallite size in treated magnesium might exhibits the higher dissolution rate in human gastric fluid and may lead to increase the bioavailability of magnesium ions in the body. Authors gratefully acknowledged to Dr. Cheng Dong of NLSC, Institute of Physics, and Chinese academy of Sciences for providing the facilities to use PowderX software for analyzing XRD data. Authors also would like to thank Trivedi science, Trivedi master wellness and Trivedi testimonials for their support during the work. 1. Erdman JW (2012) Present knowledge in nutrition. (10thedn). John Wiley & Sons. 2. Maria-Jose M (2008) Chlorophylls – from functionality in food to health relevance. 5th pigments in food congress- for quality and health. University of Helsinki. 3. Fine KD, Ana CAS, Porter JL, Fordtran JS (1991) Intestinal absorption of magnesium from food and supplements. J Clin Invest 88: 396-402. 4. Gums JG (2004) Magnesium in cardiovascular and other disorders. Ame J Health Syst Pharm 61: 1569-1576. 5. Purvis JR, Movahed A (1992) Magnesium disorders and cardiovascular diseases. Clin Cardiol 5: 556-568. 6. Sales CH, Lde FP (2006) Magnesium and diabetes mellitus: their relation. Clin Nutr 25: 554-562. 7. Guerrero-Romero F, Rodriguez-Moran M (2006) Hypomagnesemia, oxidative stress, inflammation, and metabolic syndrome. Diabetes Metab Res Rev 22: 471-476. 8. Chereson R (2009) Bioavailability, bioequivalence, and drug selection. In: Makoid CM, Vuchetich PJ, Banakar UV (eds) Basic pharmacokinetics (1stedn) Pharmaceutical Press, London. 9. Herbert K, Thomas W, Peter M, Harald A, Klaus H, et al. (1998) Magnesium sulfate reduces intra- and postoperative analgesic requirements. AnesthAnalg 87: 206-210. 10. Gurley BJ, Wang P, Gardner SF (1998) Ephedrine-type alkaloid content of nutritional supplements containing Ephedra sinica (ma-huang) as determined by high performance liquid chromatography. J Pharm Sci 87: 1547-1553. 11. Maruyama K, Katagiri T (1989) Mechanism of the Grignard reaction. J Phys Org Chem 2: 205-213. 12. Zahra M, Farsi M (2009) Biofield therapies: Biophysical basis and biological regulations. Complement Ther Clin Pract 15: 35-37. 13. Maxwell JC (1865) A dynamical theory of the electromagnetic field. Phil Trans R SocLond 155: 459-512. 14. Trivedi MK, Patil S, Tallapragada RM (2012) Thought intervention through biofield changing metal powder characteristics experiments on powder characteristics at a PM plant. Future Control and Automation LNEE 173: 247-252. 15. Trivedi MK, Patil S, Tallapragada RM (2015) Effect of biofield treatment on the physical and thermal characteristics of aluminium powders. Ind Eng Manage 4: 151. 16. Trivedi MK, Patil S, Tallapragada RM (2013) Effect of biofield treatment on the physical and thermal characteristics of silicon, tin and lead powders. J Material Sci Eng 2: 125. 17. Trivedi MK, Patil S, Tallapragada RM (2013) Effect of biofield treatment on the physical and thermal characteristics of vanadium pentoxide powder. J Material Sci Eng S11: 001. 18. Trivedi MK, Nayak G, Patil S, Tallapragada RM, Latiyal O (2015) Studies of the atomic and crystalline characteristics of ceramic oxide nano powders after biofield treatment. Ind Eng Manage 4: 161. 19. Trivedi MK, Patil S, Shettigar H, Gangwar M, Jana S (2015) Antimicrobial sensitivity pattern of Pseudomonas fluorescens after biofield treatment. J Infect Dis Ther 3: 222. 20. Trivedi MK, Patil S, Shettigar H, Bairwa K, Jana S (2015) Phenotypic and biotypic characterization of Klebsiellaoxytoca: An impact of biofield treatment. J Microb Biochem Technol 7: 203-206. 21. Mahendra KT, Shrikant P, Harish S, Mayank G, Jana S (2015) An effect of biofield treatment on Multidrug-resistant Burkholderiacepacia: A multihost pathogen. J Trop Dis 3: 167. 22. Patil S, Nayak GB, Barve SS, Tembe RP, Khan RR (2012) Impact of biofield treatment on growth and anatomical characteristics of Pogostemoncablin (Benth). Biotechnology 11: 154-162. 23. Altekar N, Nayak G (2015) Effect of biofield treatment on plant growth and adaptation. J Environ Health Sci 1: 1-9. 24. Shinde V, Sances F, Patil S, Spence A (2012) Impact of biofield treatment on growth and yield of lettuce and tomato. Aust J Basic Appl Sci 6: 100-105. 25. Lenssen AW (2013) Biofield and fungicide seed treatment influences on soybean productivity, seed quality and weed community. Agricultural Journal 8: 138-143. 26. Sances F, Flora E, Patil S, Spence A, Shinde V (2013) Impact of biofield treatment on ginseng and organic blueberry yield. Agrivita J Agric Sci 35. 27. Trivedi MK, Tallapragada RM (2008) A transcendental to changing metal powder characteristics. Met Powder Rep 63: 22-28, 31. 28. Trivedi MK, Tallapragada RM (2009) Effect of superconsciousness external energy on atomic, crystalline and powder characteristics of carbon allotrope powders. Mater Res Innov 13: 473-480. 29. Narlikar JV (1993) Introduction to cosmology. (2ndedn), Jones and Bartlett Inc., Cambridge University Press. 30. Raza K, Kumar P, Ratan S, Malik R, Arora S (2014) Polymorphism: The phenomenon affecting the performance of drugs. SOJ Pharm Pharm Sci 1: 10. 31. Torrado G, Fraile S, Torrado S, Torrado S (1998) Process-induced crystallite size and dissolution changes elucidated by a variety of analytical methods. Int J Pharm 166: 55-63. 32. Trivedi MK, Patil S, Tallapragada RM (2014) Atomic, crystalline and powder characteristics of treated zirconia and silica powders. J Material Sci Eng 3: 144. 33. Dokoumetzidis A, Macheras P (2006) A century of dissolution research: From Noyes and Whitney to the biopharmaceutics classification system. Int J Pharm 321: 1-11. 34. Dhabade VV, Tallapragada RM, Trivedi MK (2009) Effect of external energy on atomic, crystalline and powder characteristics of antimony and bismuth powders. Bull Mater Sci 32: 471-479.